Mmmmmm, a properly roasted pork tenderloin is a wonderful thing to behold. For most of my life, the pork I ate was cooked TO DEATH because of fears about parasites (which is understandable) but it made me think I hated pork and that it was always bone dry, bland, and tough. Nope! It can be amazingly flavorful, tender and juicy if seasoned adequately and cooked properly. Here is how I did it! First, choose high quality meat. Here are several companies I like (I am not sponsored and do not get paid for mentioning them, I just like them a lot) Belcampo Meat Co, Autonomy Farms, Primal Pastures, Butcher Box, Bavette Meat and Provisions, Culture Club 101, , or other local farms and producers in your area-search what is available in your area by clicking here. Ok, now onto recipe stuff! Pull the pork tenderloin out of the refrigerator an hour before cooking to temper the meat. Tempering helps a cut of meat cook more evenly and more quickly. While the meat is tempering, mix the seasoning blend ingredients in a small bowl and rub all over the pork tenderloin. Preheat oven to 425 degrees. 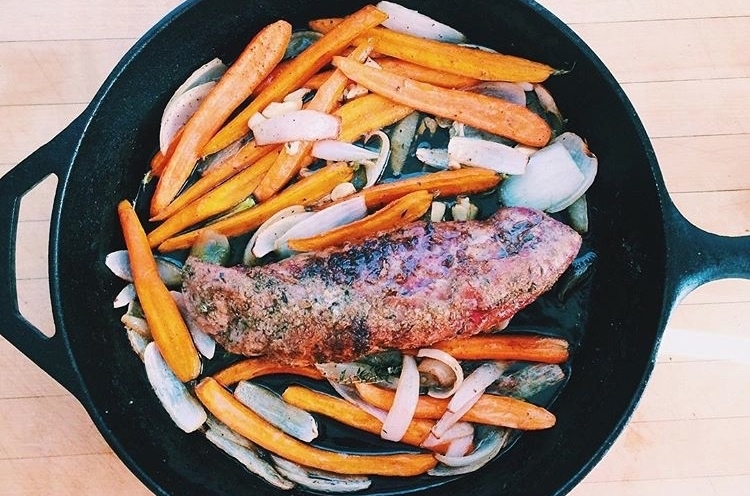 Using an over safe pan such as a cast iron skillet, preheat 2 tablespoons of oil over medium high heat and place the tempered spiced tenderloin in the pan. Allow the outside of the tenderloin to brown in the pan for approximately 2-3 minutes on each side. Add a teaspoon of the minced garlic to the oil in the pan while the last side of the tenderloin in browning and turn the browned tenderloin through the garlicky oil and minced garlic at the end of cooking. Remove pork tenderloin from pan and set on a plate. Add the sliced carrots and onion to the pan and using tongs toss the vegetables in the pan oil. Add the remaining 3 tablespoons of oil, sea salt, pepper, thyme, and garlic to the vegetables and toss to coat. Place the pork tenderloin on top of the vegetables and put in the preheated oven and bake for 20 minutes or until the thickest part of the loin reaches 145 degrees using a kitchen thermometer. Remove the tenderloin from pan, put on clean plate, cover with aluminum foil, and allow to rest 20 minutes (don't forget this step! It is so important to allow meat to rest so the juices can redistribute into the muscle and get so tender, juicy, and flavorful). Continue to let the vegetables roast for another 20 minutes while the pork rests until they are golden brown and tender. Slice the pork tenderloin into rounds on an angle against the grain, taste for seasoning and serve with quinoa, rice, or a just nice green salad!